Honda Civic Interior, Sat Nav, Dashboard | What Car? The Civic has a fairly low driving position but the gearlever is set relatively high, so you don't need to reach far to grab it. The seats are comfortable, providing decent side and thigh support, and electrically adjustable lumbar support is standard on SR trim and above. That said, adjusting the angle of the backrest is a bit fiddly, because you have to pull a lever and shift your weight back and forth. The steering wheel also has plenty of adjustment, while the pedals line up nicely with the driver's seat so you don't need to sit in a crooked position. The air-con controls are also easy to reach and intuitive to use. 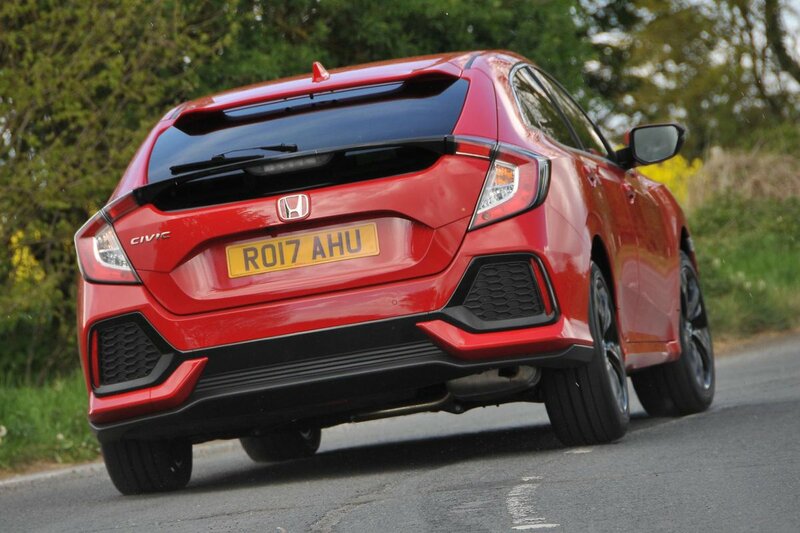 The Civic's coupé-like rear styling comes at the expense of over-the-shoulder visibility, although you do get a reversing camera as standard on SR trim and above to help mitigate this. Meanwhile, front and rear parking sensors are standard on all but entry-level S trim. Seeing out of junctions and roundabouts isn't an issue, despite the fact that you sit quite low in the car. Meanwhile, powerful LED headlights are optional on our favourite SR trim and standard on Sport and above, making it easier to see in the dark. 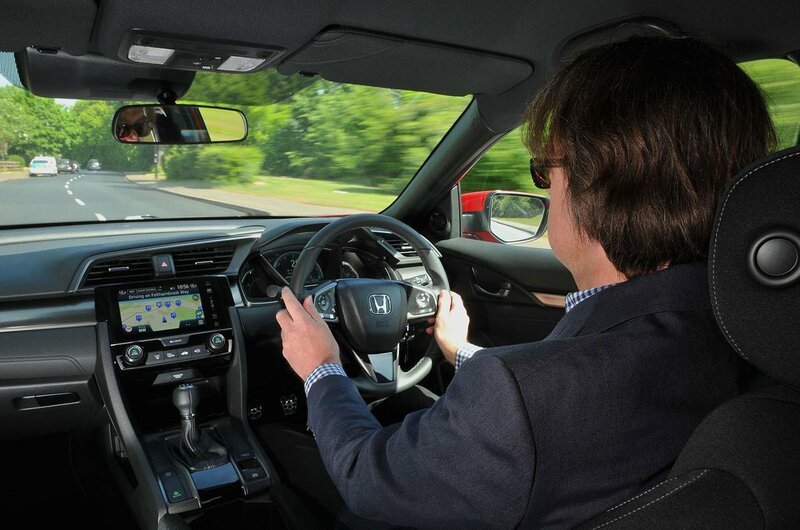 We won't beat around the bush: the Civic has one of the worst infotainment systems of any modern family hatch. The 7.0in touchscreen (standard on all but entry-level S and SE trims) is disappointingly low in resolution and inconveniently angled upwards, so it reflects the sun more than it displays anything else. Worse still, the menus are complicated, the screen is often sluggish to respond and even tweaking the volume is frustratingly fiddly. Mercifully, Apple CarPlay and Android Auto smartphone mirroring are standard on SR trim and above, so you can use more familiar apps on your smartphone instead. Entry-level S models don't get a radio at all, and while stepping up to SE gets you an AM/FM/DAB radio, the system is very basic. SE models and higher come with an adequate eight-speaker sound system, while upgrading to EX trim gets you a punchier 11-speaker stereo. 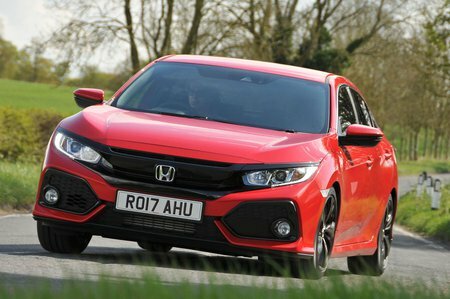 While the Civic’s interior quality isn’t up to quite the standard of, say, the Volkswagen Golf or Audi A3, it is a step up from what we’ve seen before from the Japanese manufacturer. There aren’t as many soft-touch plastics as you'll find in many European rivals, but the Civic's dashboard feels well screwed together and the rotary dials for the climate control are pleasingly weighty and click reassuringly when you twist them. Put simply, you won't feel short-changed.